A collection of 18 Nantucket inspired home designs. 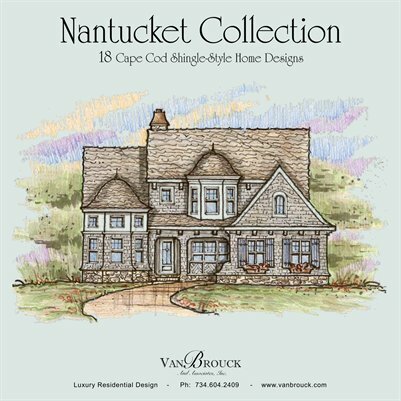 Beautifully designed and illustrated to capture the essence of Cape-Cod and Shingle-Style appeal. One of the vernacular home design styles that is a continuing source of inspiration and a design favorite of our firm is the Shingle Style home design, which is typically associated with Cape Cod, Nantucket, Newport, eastern Long Island and coastal Maine. Our award winning Shingle Style home designs capture the creative essence of this Cape Cod / New England style with wide rambling porches, shingled turrets, balconies, bay windows and playful dormers. Natural light floods into the interior spaces from beautiful multiple windows. Exquisitely painted millwork detailing and authentic Cape Cod Shingle Style design details, like painted beamed or coffered ceilings, are carried throughout the interior design of our Cape Cod style homes.